Bots automate chat, and they’re quite effective at it. Take advantage of the Facebook messenger bot to answer common initial questions from leads – with no time drain on your staff. Here are some tips on making the Facebook chat bot effective. The most important step in making a chatbot effective is discovering frequently asked questions that the bot can answer. These might be typical questions about location, hours, or basic offerings. 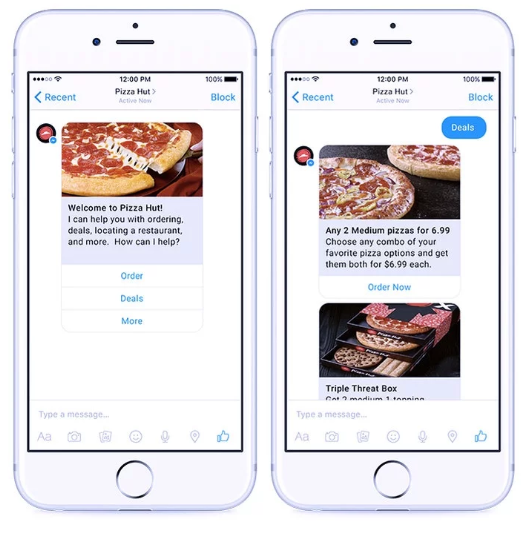 For example, restaurants can have a bot answer questions about menu items or specials. Service providers may provide basic service and pricing info. As you use Facebook messenger initially, you’ll discover questions that come up often that you can let the bot handle. What you want to accomplish with bots is alleviating the need for staff to respond to FAQs where the answers are repetitive and straightforward. Your messenger bot will be most effective when you map out answers in sequence. In other words, you can set the bot up so it funnels people towards the action you want them to take. 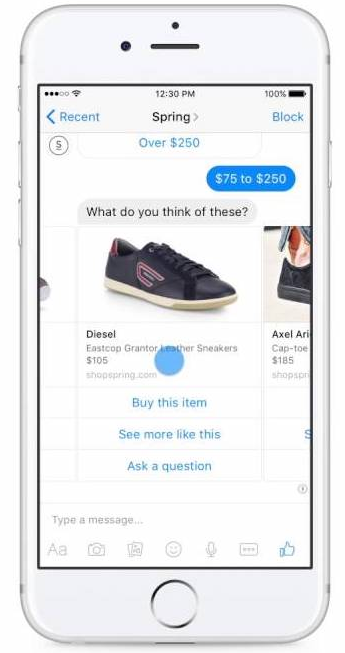 Keep in mind that your bot responses can be in the form of a question where the answer moves the person a step further in your purchase funnel. As you develop your questions and answers, you can increase the amount of content the bot provides that moves people towards buying. As much as possible with the messenger bot, you want to control the direction of the conversation. The best way to do this is with a call to action button. Let the bot give people the option to act, and they will. Also, be sure not to give too many options or you’ll cause people to hesitate. When you create your messenger bot responses, you can give it voice so it sounds more like a person. Create a conversational, natural voice that mimics what you’d have a live customer rep say. Keep it casual, using conjunctions and other forms of natural speech. You can also make it so the bot uses the person’s first name, which is a friendly touch. Basically, you don’t want people to recognize they’re chatting with a bot. Give the program some warmth. However, don’t make it chatty. Make sure your answers are short and to the point. Once you get your bot up and ready to fully converse with customers, test it a few times with staff to make sure the conversation is fluid, logical, and effective. You may need to tweak some of your responses or the directions of the conversation to make sure you’re providing an excellent customer experience. When you have your process refined, you can add bot technology to your website to guide leads into your sales funnel in the same way it does on Facebook. The best business bot systems are set up to escalate to a human rep when the bot can’t provide the info a customer is looking for. Make sure you have a human rep who can take over when the bot indicates the customer issue needs escalation. You don’t want to leave customers or leads in the lurch with unanswered questions, nor do you want them recognizing they’re dealing with automation that’s unsatisfactory at dealing with their issue. 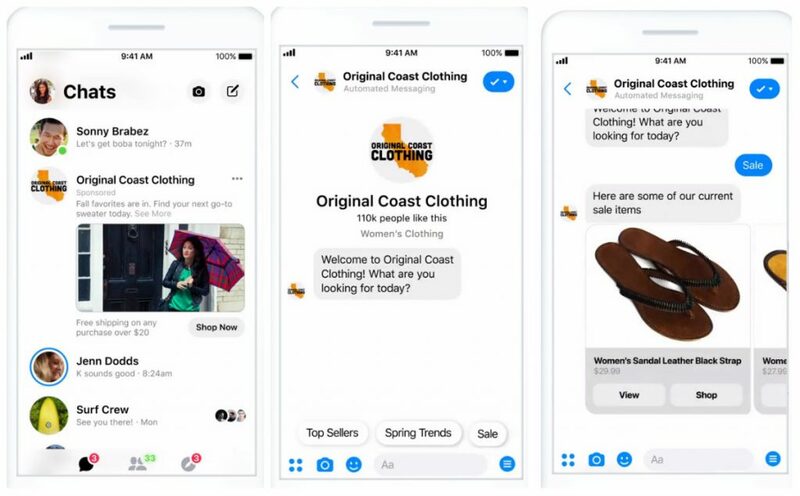 You can have a designated Facebook ad campaign that targets people while they’re on messenger, then use the bot to converse with them about what they’d like to buy. Again, notice the call to action buttons on each step. Messenger is, of course, very popular for people communicating with friends. It can be a powerful place to slip in the right kind of ad. When someone doesn’t buy from you – particularly if they looked you over and engaged with your brand – it’s because they had a concern crop-up. Some question didn’t get answered; uncertainty lost the sale. Facebook and other messenger bots can help make sure this doesn’t happen. It helps you to go out of your way to answer every question shoppers have. And it does so in an efficient way that doesn’t bog down your sales staff. Of course, for this to work you need to have a Facebook business page. You’ll also want to be running Facebook ads that help you build your presence and increase your audience base. Those efforts will make sure your bot has someone to chat with.